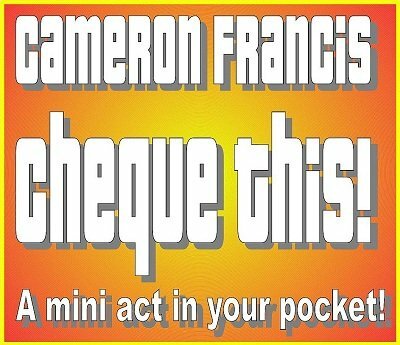 An incredible mini-act that fits in your pocket. Four phases of knock-out magic that you can do anytime, anywhere! A five dollar bill is borrowed and signed. The magician claims he will make the bill vanish. He then says he might not be able to bring the bill back and in that case, would the spectator accept a cheque? At this point, the spectators realize that the bill is now completely gone and in its place is a cheque for five dollars! The magician brings out a deck of cards and one is selected, say the Seven of Diamonds. The magician cuts to a card... but it's the wrong one. He then waves the cheque over the deck. He then says, "The cheque now tells me that your card is the Seven of Diamonds... No, really. It does!" It is now seen that in the middle of the routing number on the cheque is printed, "7OFDIAMONDS"! The magician waves the cheque over the indifferent card. It is turned over and revealed to now be the Seven of Diamonds! The magician turns the cheque over. On its back is written "Me The Box". The magician looks confused but then realizes that he is holding a cheque. Therefore, "Check the box". The magician doesn't even touch the box. The spectator opens it herself and removes the only thing inside: a folded bill. But not just any bill, it's the spectator's SIGNED FIVE! 1st edition 2012, 7 pages.